Our Telling It Like It Is project is a group of adults with a learning disability who are keen to have their voice heard. Originating out of the resettlement agenda and part funded by Belfast Health & Social Care Trust and South-Eastern Health & Social Care Trust groups were established in Belfast, Lisburn, Downpatrick and Muckamore Abbey Hospital. ARC is committed to increasing the capacity of people with a learning disability to have a say in issues that affect their lives. We do this by assisting them in developing new skills or experiences through providing in-house training, supporting their contributions to public consultation processes and enabling them to facilitate workshops at relevant external events. A recent example was TILII facilitating a workshop during a ‘Vulnerable Witness Conference’ at the request of Queens University Belfast and Department of Justice. 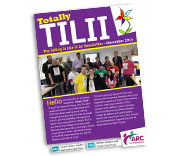 Read TILII’s newsletter and the Roving Reporter Good News stories, produced to learn more about specific activities recently undertaken. ARC has supported 3 individuals becoming voluntary Lay Assessors within RQIA, whose role within inspections & reviews include interviewing service users and visitors about their experience. If you wish to learn more about TILII please contact Louise Hughes on 028 9038 0965.